Scotland’s best beaches? Most people visit Scotland for the attractions, history, culture, scenery, outdoor activities or events, but we have some fantastic beaches. Right, I hear you. Scotland would probably not be the first place that springs to mind for glorious sandy beaches, and the chances are you wouldn’t get two full weeks of sunshine. But if you can manage to fit in a day trip or two to one of our best beaches, then you’re in for a pleasant surprise and a nice relaxing time. I mean, if you can imagine a beach in say, France, Spain, Portugal or the Canary Islands, with white or golden sand and beautiful views out to the clear blue sea, then take away the crowds of people and all the noise, then you have a Scottish beach. Perfect peace and isolation. What you won’t find is the same level of facilities or amenities, like beach bars and fast food outlets every few hundred yards. I would recommend that you go well prepared, with a picnic hamper, and pack sun loungers or deck chairs in the car, because our best beaches are in very remote locations, which makes then even more magical. DURNESS BEACH: The charming town of Durness is off the beaten track, accessible only by a single-track road, but well worth visiting for a fabulous, uncrowded beach. LUNAN BAY is a beautiful two mile stretch of sandy beach, situated just about three miles south of Montrose on the north east coast. Horseriding and surfing are popular here, and there’s a car park. LUSKENTYRE BEACH is on the Isle of Harris, in the south, near Tarbert. This is the largest, and arguably the best beach on the island. Admittedly it is quite remote (from the mainland) but well worth a visit. SCARISTA BEACH is also on the Island of Harris, on the main road just south of Tarbert. It’s the perfect setting for a quiet retreat, and it’s very beautiful. Some couples have been married here. SANDWOOD BAY offers fantastic views. Situated on the furthest north west tip of the mainland, it’s very remote and there is no direct road access. From Blairmore, there’s a 4 mile long footpath. 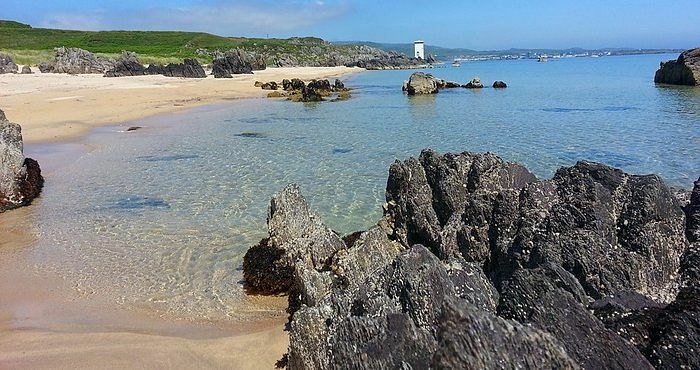 KILORAN BEACH is situated on the Island of Colonsay, in the Argyll and Bute Region. There’s also a long walk with this one, but it’s worth it for one of the best beaches around. Ideal for cycling and hiking. THE SILVER SANDS OF MORAR is located on the north west coast near Mallaig. It has everything for lovers of beauty. Mallaig is where you get the ferry to the Isle of Skye, and the views are stunning. DORNOCH BEACH is to be found about 60 miles north of Inverness. A good sandy coastline, scenery and wildlife make this one of our best beaches. Madonna and Guy Ritchie got married in Dornoch. WEST SANDS at St Andrews is fabulous. Almost 2 miles of sand and dunes, and not far from the famous golf course. The opening scenes from the motion picture ‘Chariots of Fire’ were shot here. Well this is my idea of Scotlands best beaches, and although some are quite remote, they offer a rare mix of sand and solitude. It’s worth making the effort to visit them. The Scotland Travel Information page has all the information you need for travelling to and within Scotland. get helpful advice on passports and visas, currency, weather, holiday extras, useful travel links and more. Scotland Hotels – Search all Scotland hotels in major cities, towns and regions. Get information on the surrounding area, amenities and attractions before your visit.